While I was out driving with the family the other day, we started talking about butter. Not exactly a typical topic of conversation but not out of the ordinary either in that I have one of those families where we will happily talk about food instead of the Kardashians and their ilk. We were actually trying to come up with sayings about butter like “She must be butter cause she’s on a roll” or “He’s smooth as butter.” when my wife asked why so many things that aren’t butter say that they are butter ? It was a very good question and it did give me pause for thought and almost made me miss my exit too. It also led me to ask why so many products out there try to ride Butter’s coattails ? All you have to do is look in my fridge or look in my pantry or look on my spice rack to know that I have a lot of products that claim to be butter but really aren’t. I have apple butter, cinnamon apple butter, maple butter, mango butter, banana butter, avocado butter, pumpkin butter, chipotle lime butter and three different kinds of peanut butter (regular, white chocolate & dark chocolate). I even have a tub of half eaten stuff that claims you can’t believe that it’s butter left over from my DIE-t but we can all believe it’s not butter so that one really doesn’t count. All of these items and more have butter in their name but they really aren’t honest to goodness 100% creamery butter made from cows. All of these products and more want you to think that just because they spread smoothly that they are like 100% creamery butter. 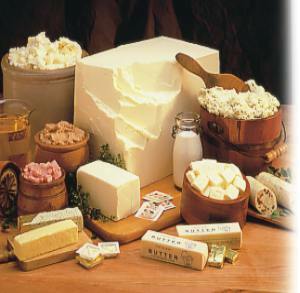 All of these products and more want you to think that they have that same quality that 100% creamery butter has. All of these products and more want you to believe that by seeing the word “butter” in their name or product description that you will immediately begin to have warm feelings from your youth just through word & sensory association. Sadly, the fact of the matter is, they aren’t 100% creamery butter. You can’t substitute any of them successfully for 100% creamery butter either. Can you imagine using a pumpkin butter in the Beurre Blanc for your filet of sole ? How about putting avocado butter on your pancakes or waffles just before pouring on the maple syrup? I don’t know about you but I know I’m not about to try and fry an egg in peanut butter and I think, no I know, my Grandmother would come back from the grave to haunt me if I ever tried to put mango butter in her Holiday Spritz Cookies recipe. Let’s face it, using non-butter “butter” in place of 100% creamery butter isn’t even something they would do on one of those bizarre reality cooking shows you see on TV these days. So just because it says “Butter” on the label doesn’t mean that it’s real 100% creamery butter or that it’s even good which begs the question, do they sell “Trump Butter” ? I am an Allrecipes Brand Ambassador (a voluntary position) and I’m not compensated for my work with Allrecipes.com. Products received from advertisers are only used for experienced-based reviews on Swampy’s Kitchen & Behind The Shades. The reviews, content and opinions expressed in this blog are purely the sole opinions of Doug Matthews. This blog was written in support of the Wisconsin Milk Marketing Board and America’s Dairy Farmers and their GO BOLD WITH BUTTER campaign.